The New Citizenship Test is Now the Only Test You Can Take! Which citizenship questions should I learn? Which one is easier? Well, forget about the old test, learn the new one. You have no other choice as of today! Citizenship Coach has been helping thousands of immigrants study for their naturalization exam with their online class. For a very low study fee (as little as 25 cents a day) you can study for your test any time you want, with real people in streaming video. You can also learn pronunciation of difficult words. 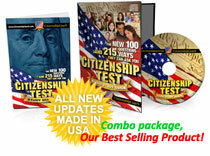 Visit www.CitizenshipCoach.com to try 15 lessons for free!